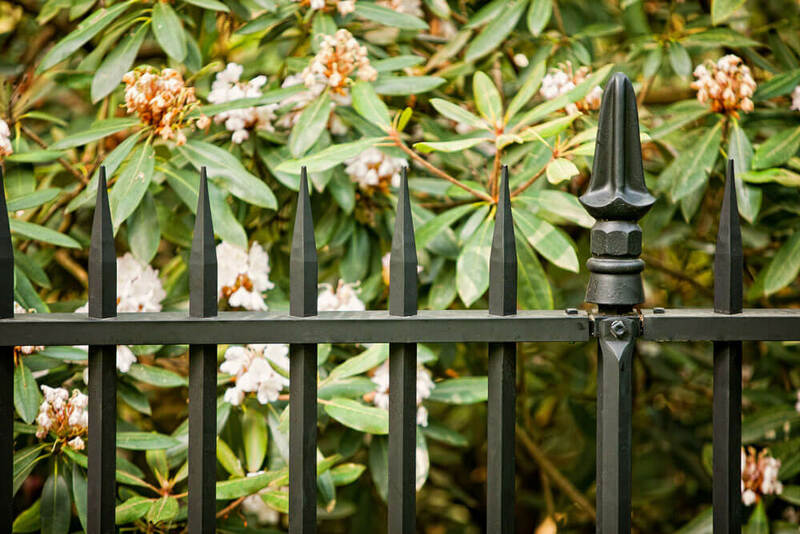 A Philadelphia landscape architect and homeowner wanted to replicate a security wrought iron fence, built in 1927 by Samuel Yellin. The desire for this security fence was multi-faceted. The property had lush landscaping, which was prone to deer damage, the family had a valuable art collection, the entire built space was an architectural master piece, utilizing European artifacts and current craftsmen to produce exquisite visual synergy across all trades. And the family was very privacy oriented, wanting their own private haven to be able to spend time together, entertain friends, peers and colleagues without fear of intruders or party crashers. The fence also was important in that it defined the property perimeter and needed to enhance the landscape design and site architecture. The site did provide it’s set of unique challenges. There was 82 ft of elevation change from front to back, there were many huge specimen trees, 60 ft to 80 ft tall and 3 ft to 4 ft wide. And there could be no allowance for any security breaches on the property fence anywhere. The design team looked at various security fence options. In the end they made the decision to go with forged solid air craft grade aluminum property fence. 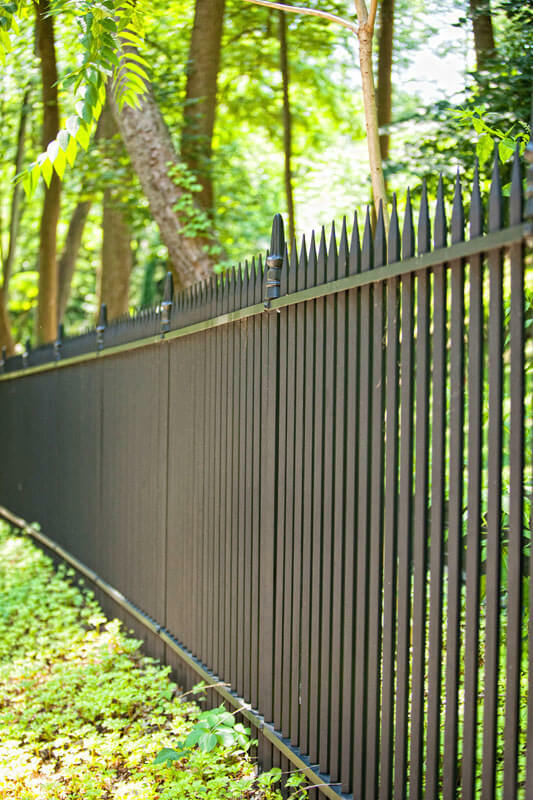 Forged and powder-coated with a black matte, it was visually indistinguishable from old Wrought Iron Fence. All the picket points were forged with traditional method. Post finials were replicated and custom cast to the correct proportions. Because of the topographical issue, every property fence post location had to be determined and individually have its elevation point documented. Then everything was designed in CAD and custom created. All line fence was 8ft high to deter climbing or jumping over. The install was challenging, maneuvering on the steep slopes, transporting fence posts and panels up and down to their correct location, working around the lush landscape with minimal disturbance and compaction, utilizing equipment with as low as 6 psi foot print. The entire property was enclosed with this stately metal fence. Custom driveway gates were created, underground gate openers installed for access control. The security company was happy with the caliber of fence as it made their job easier of providing physical, executive and property security. The landscape architect, building architect, builder and homeowner were thrilled, the whole thing came together and was cohesive with their design sensitivities, creating the effect of a Philadelphia Mainline Estate that would have been created 100 years ago. With many stops and starts, working around others on site trades, the entire Wrought fence project took about 3 years to complete.